Yes Paper Cups can and are being recycled. Paper cup recycling has been considered to require a specialist process at paper mills, restricting the opportunities for recycling. Through the actions of the PCRRG and its’ members this has been shown not to be the case. There are now four facilities in England re-pulping paper coffee cups using both batch and continuous reprocessing systems. In order to ensure the used cups are received by the paper mills in the best condition for recycling they should be places in segregated waste streams by the consumer once they are finished with. The segregated waste stream also ensures that it can be taken to one of the four mills re-pulping cups, or to the facilities processing them into novel plastics. What are paper cups made from? Paper cups are generally 95% (by weight) paper or card and 5% a thin coating. The coating is bonded to the cup in order to prevent the cardboard fibre from absorbing liquid contained within the cup and therefore becoming wet and collapsing. Polyethylene plastic (PE) is the most prevalent coating material. What happens to compostable packaging on the high street? Compostable packaging disposed of on the high street on-the-go will not be sent to composting facilities. It is not possible to identify the compostable format of any board coating in material handling facilities (MRF’s). And so compostable packaging will either be considered non-recyclable because of its contact with contaminating food stuffs or other waste materials in this stream, in which case it will go to landfill or incineration. In landfill the compostable coatings may begin to break down and become a source of methane gas, a powerful greenhouse gas. Or if it were to be presented for recycling with general mixed paper waste the compostable coating would become a contaminate to the recycled paper process. Compostable cups and packaging do not effectively breakdown under other circumstances, they do not breakdown if discarded as litter, or in landfill if discarded in general waste. A recent study by the Dutch Ministry of Economic Affairs and Climate Policy has shown that recycled cups were shown to have a better environmental performance while digestion and composting results in a higher net reduction in CO2 emissions. Stock Products – To order stock product directly from Benders there is an MOQ of 50 cases. This can be split into different product types as well as lids and other complimentary products. Stock Products below 50 cases – Orders of stock product below 50 cases are usually managed through an approved Benders distributor. Fill out the ‘contact us form’ clearly stating the volume you wish to order and a member of our team will contact you concerning your requirements. Custom prints – Custom print can only be ordered directly from Benders. The MOQ for custom print is currently 100,000 pieces per cup size. UK – Benders deliver nationwide on orders of 50 cases or above (DAP). Products can also be collected from our manufacturing site in Wrexham (EXW). Orders less than 50 cases will normally come via an approved Benders distributor. Europe – Benders deliver to the majority of European countries. Products can also be collected from our manufacturing site in Wrexham UK. Rest Of The World – Benders do not operate a transport infrastructure outside of Europe but you can still order and collect from our factory. Do you stock cold cups? Benders are dedicated to the manufacture of paper cups for hot drinks and do not manufacture or stock cold cups. We do have an arrangement with a cold cup producer if your requirement is part of a larger tender. Can your hot cups be used for cold drinks? Cold drinks, especially those with ice added, create condensation on the outside of the cup. Paper cold cups have a PE coating on the outside of the cup too to protect the side wall from this moisture. Hot cups do not have PE on the outside of the cup and so we would not recommend their use for cold drinks. What materials do you use to manufacture your cups? Benders Paper Cups are manufactured from Virgin SBS (Solid Bleached Sulphate) paper cupboard with a PE (Polyethylene) lining. The paper board comes from trees grown in sustainable forests in Europe and the USA. The board weight and thickness varies according to the size of the cup. Do I need a Single Wall or a Double Wall cup? Benders manufacture two types of single wall cups a) those designed for automatic vending machines and b) those used in ‘coffee to go’ applications. We also manufacture three types of double wall cups, that offer increased insulation. Single Wall cups are suitable for service scenarios where a customer does not travel far from the point of service. Though cup sleeves can be used with single wall cups where boiling water is used to produce a cup. Browse our single wall cup range here; http://www.benders.co.uk/products/cups/. Double wall cups are ideal for drinking on the move where the increased insulation means that drinks stay warmer and can be held more comfortably for longer. Browse our double wall cups here; http://www.benders.co.uk/products/cups/. Which market sectors do Benders focus on? At the Workplace includes; vending operators, office coffee services & water, public sector, contract caterers and facilities management companies. Further information on the best products for the At The Workplace sector can be found here: http://www.benders.co.uk/at-the-workplace/. On The Go includes; Coffee shops, Quick Service Restaurants, Beverage brand owners and roasters, travel and leisure operators, pubs and clubs. Further information on the best products for the On the Go sector can be found here: http://www.benders.co.uk/on-the-go/. For Resale includes; wholesalers, retailers, and Cash & Carries. Further information on the best products for the For Resale sector can be found here: http://www.benders.co.uk/for-resale/. Do I require lids with my paper cups? The answer is yes if the drink is to be taken away for consumption. Benders sell a range of lids to complement our paper cups. Black or white lids can be ordered in either a domed or flat tear back version. All Benders lids feature a tight plug fit rim specifically developed alongside our paper cups. You get 100% guarantee on performance when using a Benders lid on a Benders cup. Further information on lids can be found here: http://www.benders.co.uk/products/paper-cups-lids/. How do I submit artwork for custom printed paper cups? Artwork for printed paper cups can be sent directly to our Customer Services team. Artwork is best if it is submitted using AI, EPS or PDF formats as flat vector line work. A colour visual is produced once the artwork has been reworked onto the cup template for you to approve, Origination charges apply to new print jobs. For further information please visit the custom print page: http://www.benders.co.uk/products/custom-printing/. We work to a day 1 for day 3 lead time across our entire stock range. The lead time for any new custom print is 6-8 weeks for SW cups and 10-12 weeks for insulated ones. Benders reserve the right to modify these lead times from time to time. What major certifications do you have? The board used to manufacture our cups has full PEFC Chain of Custody Certification. This guarantees that the source material comes from sustainable forests and thereby is fantastic for our environment: http://www.benders.co.uk/certifications-and-accreditations/#pefc . Benders UK factory is a BRC Grade AA facility Further information on BRC can be found here: http://www.benders.co.uk/certifications-and-accreditations/#brc. Benders also have a SEDEX Certification. Further information on Sedex can be found here: http://www.benders.co.uk/certifications-and-accreditations/#sedex. Benders are also leading members of several trade associations Further information on the trade associations Benders work with is available here: http://www.benders.co.uk/certifications-and-accreditations/#fpa. Polyethylene – this is the most common form of plastic and is the food safe low density coating applied to the inside of the cup to protect the board from liquid. Programme for the Endorsement of Forestry Certification – an international, non-profit, non-governmental organization which promotes sustainable forest management through independent third party certification. Chain of Custody – is a mechanism for tracking certified material from the forest to the final product to ensure that the wood, wood fibre or non-wood forest produce contained in the product or product line can be traced back to certified forests. British Retail Consortium – A quality control process certification that has a special category covering companies involved with packaging and packaging materials. Automatic Vending Association – A trade association for the companies active in the UK vending industry. Foodservice Packaging Association – A trade association for companies active in the UK Foodservice packaging industry. Supplier Ethical Data Exchange – AA not for profit membership organisation dedicated to driving improvements in responsible and ethical business practices in global supply chains. Paper Cup Recovery & Recycling Group – A Trade association that exists to develop collection and recycling opportunities for paper cups and identify and support solutions that sustainably transform used paper cups into a valuable resource. Benders are a founder member of it. Material Recovery Facility e.g. a recycling centre. A charge made when a new custom print is signed off by a customer for the manipulation of the artwork and for the ordering of print plates. 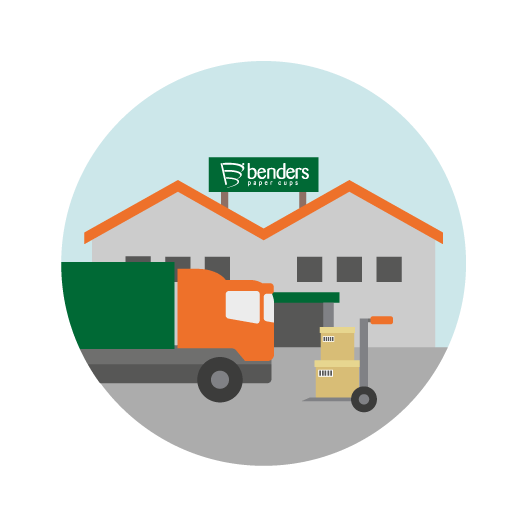 Minimum Order Quantity – the amount of product in cases or pieces that must be ordered to be supplied directly by Benders. The amount of time between an order being placed and an order being delivered. Delivered At Place – An incoterm wherein we deliver product to a specified address. Contact one of our specialised team today.